The AT4050 was initially released in the mid-1990s, as the first multipattern condenser in Audio-Technica’s groundbreaking 40 Series. It has remained so popular throughout the past 15+ years that A-T has just released a limited-edition anniversary model, the AT4050/LE, with a beautiful commemorative metallic silver finish and a custom wooden storage case. We’ve had a pair of AT4050’s on hand for a while, and took the opportunity to review them in ways that haven’t been well covered by the trade press before. 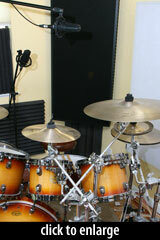 In part I, we’ll try the mics on drum overheads, in five different configurations. In part II, Tony SanFilippo writes about ten-plus years’ worth of experience with the AT4050, and describes his favorite applications for the mics. Because the AT4050 is a 3-pattern mic, numerous drum overhead configurations become available beyond the standard “RecorderMan,” XY and AB (spaced pair) approaches. 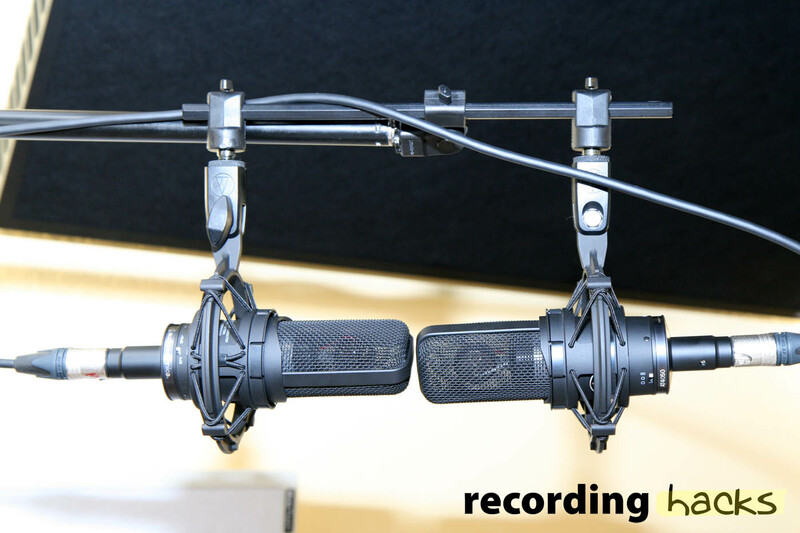 I recorded the standards, as well as Blumlein (crossed Figure-8s) and Mid-Side (Cardioid plus Figure-8). 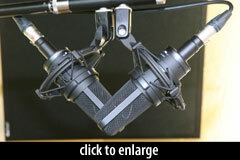 These configurations present differing challenges for the microphones. For example, the Recorderman configuration puts the mics very low over the drum kit, potentially causing the mics to overload. The XY and Blumlein arrays put most of the drum kit off-axis, potentially causing bizarre EQ problems for mics with colored off-axis response. The “side” channel of MS, hearing only reflected sound, usually needs to be gained up somewhat relative to the Mid; if the mic’s self-noise is too high, you might hear this in the track. You can hear how the AT4050’s fare in the samples below. Normally when I publish drum-overhead mic tests, you’d hear just those two mics (or in some cases, just one mic, argh). For this test, I took an alternate approach: I put an Electro-Voice N/D868 in the kick drum, so that the resulting tracks could be evaluated as a complete drum sound, not just an overhead pair. I tried to keep the kick track’s level consistent in all these clips, but because some OH configurations naturally hear more kick, you will notice some level differences from clip to clip. If you’d like to hear the raw tracks, and remix them with more or less kick, or different panning values, grab the session audio files (44/24 WAVs) here. The RecorderMan configuration is a personal favorite, and through the AT4050’s it sounds great. The track sounds like my drums in my room — or, actually, it sounds better. That might be a violation of the laws of physics, but when I’m playing the kit I definitely hear a lot of reflections and boom that the AT4050 managed to ignore. The AT4050 Recorderman track is dry, clean, detailed, and expressive. The high SPL from the snare drum caused no problems. With its onboard -10dB pad engaged, the AT4050’s max SPL is an ear-splitting 159dB. 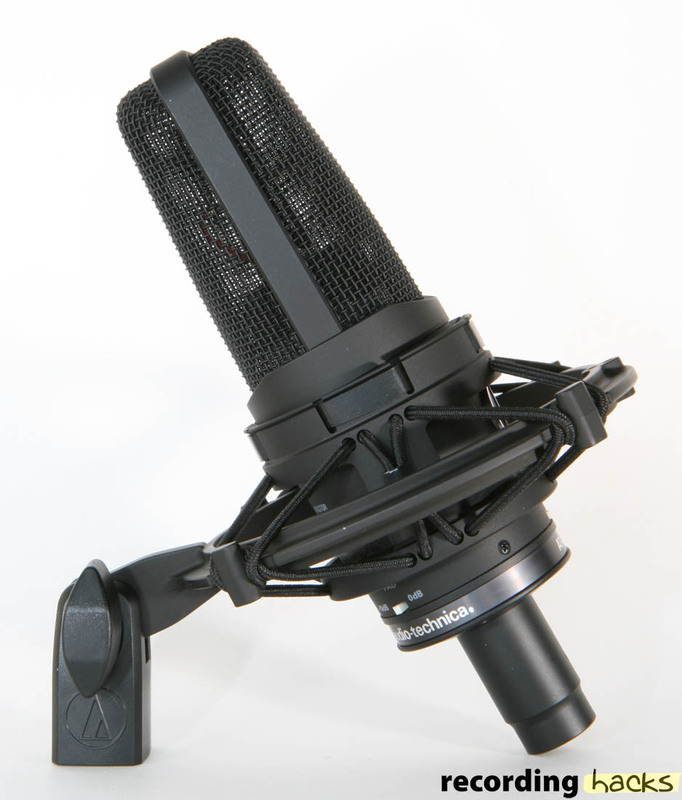 The mics are rated at 17dBA self-noise, which is moderate compared to newer designs (see the lowest-noise mics on the Mic Zeitgeist page). But for drum OH at least, the self-noise on these mics is inaudible. Listen to the silence before the drums start; there’s no fade-in on the track. You’re hearing the mics, the pres, and the room. Listen closely, and you’ll some throne squeaks. But you won’t hear any hiss from the microphone. The other OH configurations I tested provide a full palette of sonic choices. For example, XY and MS capture a subjectively small but very present kit sound (while offering excellent mono compatibility). AB captures a subjectively bigger kit, with a much wider stereo spread (and the risk of a hole in the middle) due to the space between the mics. 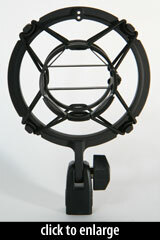 Blumlein captures much more room sound; the rear lobe of the Figure-8 pattern is hearing only the room. I think the AT4050 sounds good in most of these configurations. The cymbals are clear and defined without sounding brittle or harsh. The snare sound is crisp and clean. The toms have good tone and body. The Mid-Side and Blumlein patterns worked very well. This is in part because the AT4050’s Figure-8 pattern is nearly perfect. The published trace shows a consistent Figure-8 pattern from 200Hz–8kHz. This means the mic’s off-axis response won’t sound weirdly EQ’d. Because both Blumlein and MS capture 50% off-axis sound, consistent polar response is critical to getting usable tracks. The AT4050 performs beautifully in this regard. The XY track is the only one I don’t care for; it sounds colored in an unflattering way. But I think this reveals more about the challenges of recording loud drums in a small room, where room nodes can dramatically alter what the mic hears. 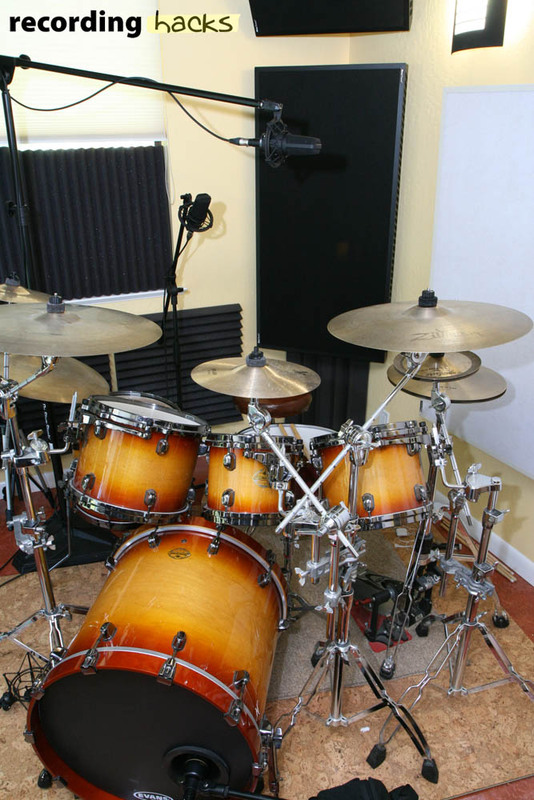 In short, I would not hesitate to use the AT4050’s above my drums. I think they do an excellent job of capturing a lively, unhyped picture of the full drum kit. My first experience with the AT4050 was just under a year after I started working at a recording studio. I was assisting the boss on a fairly important local record. The boss decided to buy a few new things for the record, including upgrading from our AT4033 to an AT4050. I still use that mic and the second one I convinced the old boss into buying some time later. That pair of mics have been on a ton of records, on a ton of sources. I really could end my section of this review by saying, “Buy an AT4050 or two (or four) and it will be some of the most useful tools you will ever own” and be done, but I won’t. My personal favorite use for the AT4050 is drum room mics. Often I have them equidistant from the top resonant BD head, about waist high. I put them on straight stands at the lowest setting. 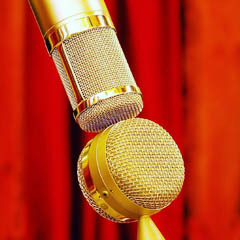 The mics are really amazing, because they give you a sense of space, but also are really great at letting you hear the personality of the player. 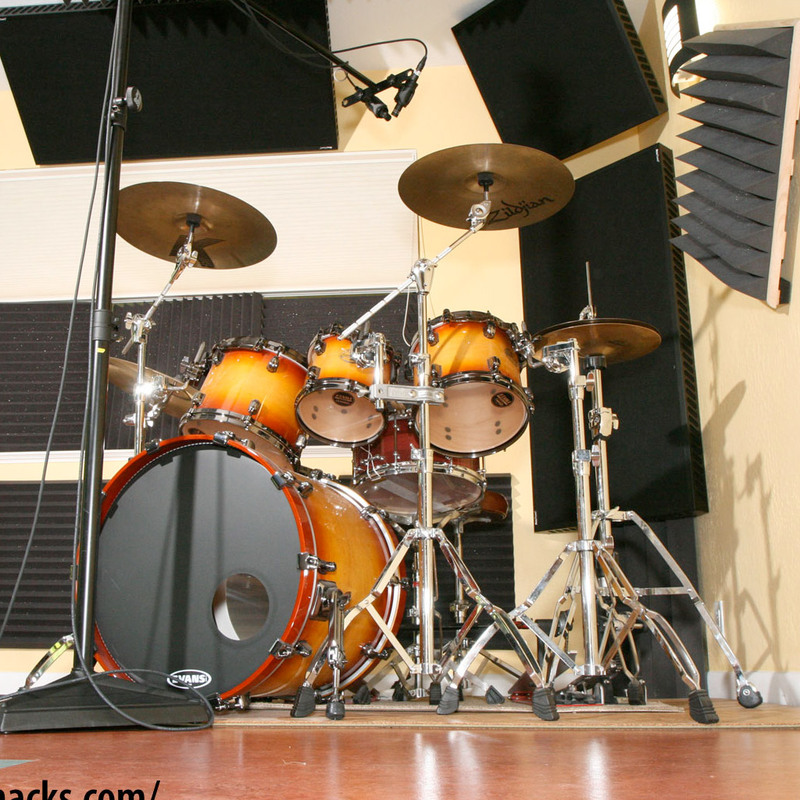 Case in point: This week I recorded the same drum-set, with the same mics, in the same room. The drummers and cymbals were different. On Monday the drummer in Kash’d played solidly, but not super hard. I had the AT4050’s in Omni and they did exactly what I expect them to. They added space, and splash, real depth, and air. Pepper them into the close mics, and don’t even think about artificial reverb. On Thursday the drummer with Husky? Played MUCH harder. He had also requested my brighter, louder, hihats (which I barely ever use… or encourage). The heavy hands of this player came right through. So much so, in fact, that I decided that I needed something different. Instead of swapping mics, I switched the AT4050’s to Cardioid and turned the mics away from the drummer. Wonderful, still the space I like, the air around the drums, but the harsh brassy sound the drummer was producing was not hitting the mics on-axis. I’ve used the AT4050’s as room mics on acoustic ensembles a number of times as well. Just like with drums, these things just WORK. I’ve had them in XY, Blumlein (utilizing the figure 8 pattern — more on that pattern later) and even M/S on a record of acoustic Irish music. That record by Bloomsday still sounds like a private performance or living room concert, intimate and clear. The AT4050’s make the record sound more believable, if that makes sense. I use the figure 8 pattern of the mics quite a bit. I really love the sound of Blumlein, because the stereo sound is great and it gives a sense of the room behind the mics. 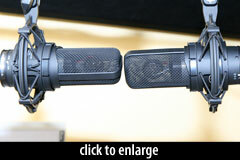 The other figure 8 advantage is the very defined and deep null points on the sides of the mics. When recording small ensembles mic placement in relation to the OTHER players becomes quite important. I can place one player in the null and get a really great sound of the source I’m pointing the mic at, without having to worry about an excess of the other player. This also becomes quite useful when recording singing guitarists. I’ll often record the vocal with a AT4050 in figure 8 to keep the guitar out of the vocal sound. Often I’ll pair that with another AT4050 with its null pointed at the singer’s mouth. This leaves me compression and EQ options that I would not have if there were a ton of bleed from the instrument into the vocal, and vice versa. I have a handful of mics that I go to for vocals. A couple of those choices are older and vibey. The have a rolled off top end, and a low mid emphasis. The issue with these wonderful old mics is that if they are not the right sound, it’s almost instantly noticeable. Enter the AT4050. The top end is fairly well extended and super clear, upper mids are clear, and the low and low-mids are full and rich. Almost every woman singer I’ve used a AT4050 with has loved the sound, and so have I. It’s the perfect ‘modern clear’ vocal mic to have as the antithesis to ‘vintage/vibey’ sounds. 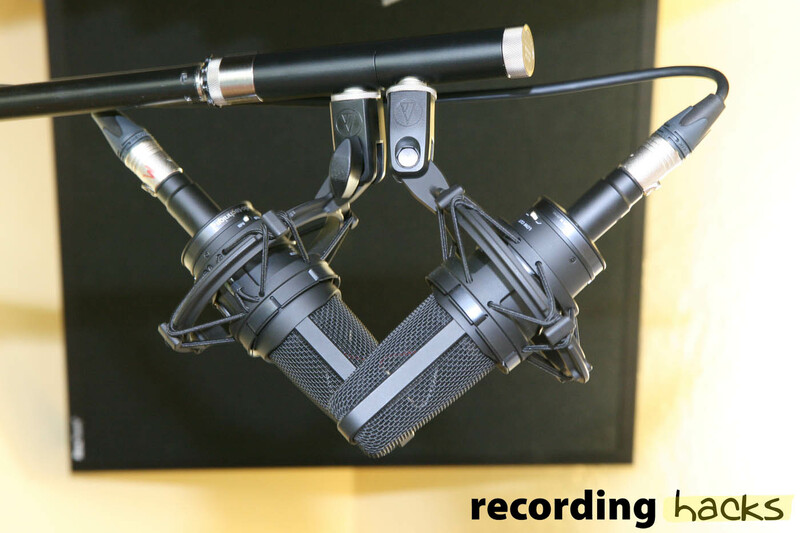 All the Audio-Technica mics I’ve used, from the inexpensive 20 Series to the premium 40 Series, demonstrate the company’s commitment to providing excellent quality at every price point. The AT4050 is no exception. The mic feels very solid, and is heavier than you’d expect. The body is well-damped. The grille does not deform when squeezed. 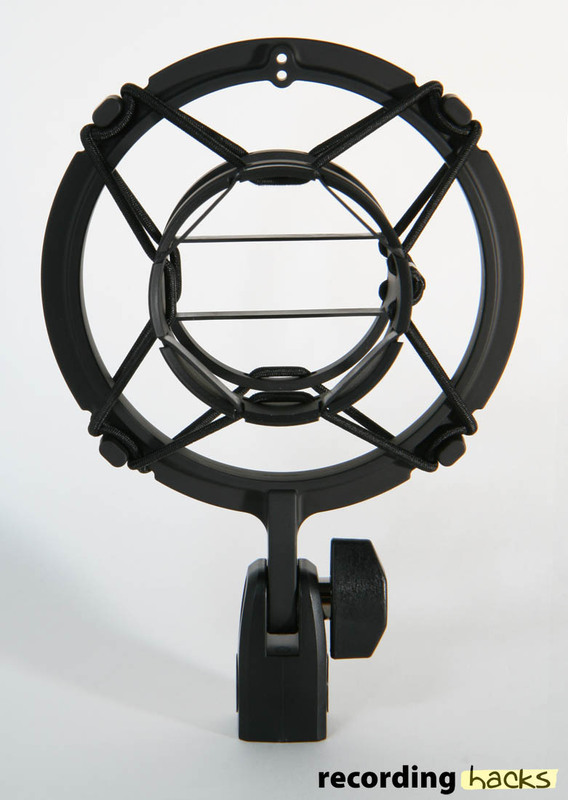 The included AT8449 shockmount will be familiar to anyone who has used the other medium- and large-diaphragm 40 Series microphones. 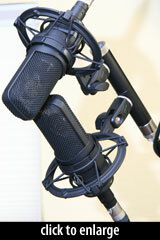 It is a low-profile suspension mount that grips the mic with a single elastic band. Re-reading Paul Simmans’ review of the AT4047MP, I’m struck that he summed up my feelings about this shockmount design precisely. There’s an ambiguity to the way the elastic band grips the mic that makes the mount feel under-designed. And yet, having used these mounts for a couple weeks, I have to admit that they work very well. It’s a snap to pull the mics out of the mounts, and scarcely harder to put them back in. The mics don’t sag, even when suspended sideways — see the Blumlein photo above. And they do seem to isolate the mics from mechanical noise, if my test of tapping the stand with a drum stick is any indication. The three switches (pattern, pad, and filter) are nicely implemented. It is easy to operate them with a fingernail, yet they provide enough resistance that they don’t move even when the mic is rotated into the shockmount. The headbasket is a relatively open weave, made of just two layers of metal mesh. This design helps reduce reflections in the vicinity of the capsule, and no doubt contributes to the mic’s clean and uncolored sound. I had an opportunity to hear the AT4050 on drums, voice, and acoustic guitar. Listening back, I’m struck that, at their worst, these mics sound honest. And at their best, they somehow improve what I was hearing in the room. The three polar patterns, high SPL capability, and moderately low self-noise make the AT4050 versatile and unfussy — you won’t have to work to get a good sound. Yet the mic has enough options to facilitate experimentation, enabling you to fine-tune or significantly alter what it hears. I think these would make excellent studio workhorse mics. “Tripolar” (3-pattern) FET condensers are the sort of mics that every studio should have a couple of, simply because they’re so useful. 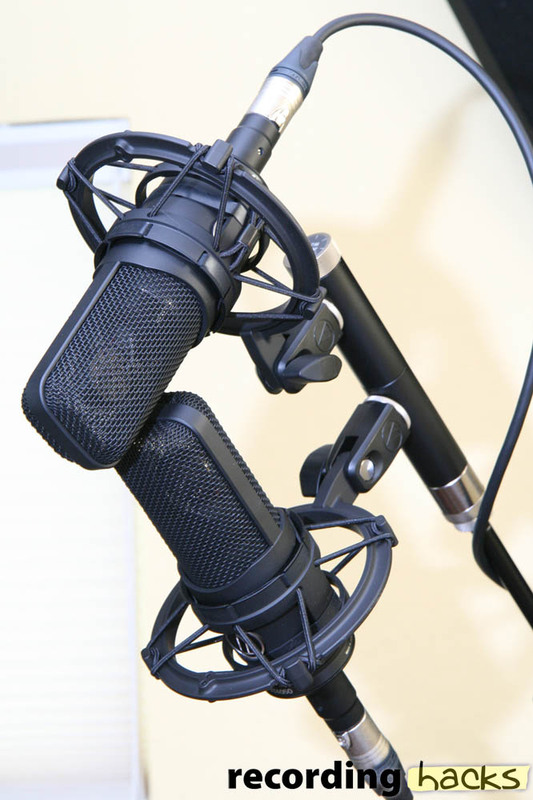 If you’re shopping for such mics, the AT4050 should be on your shortlist. 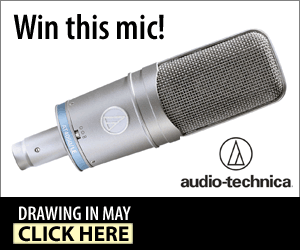 Audio-Technica (US) has generously donated one of the anniversary edition microphones, called the AT4050/LE. We gave it away in June, 2012, as part of a long series of monthly gear giveaways. To find out about this month’s giveaway, subscribe to our email newsletter. Two pairs of AT4050’s were used for this review. One is owned by Tony Sanfilippo. 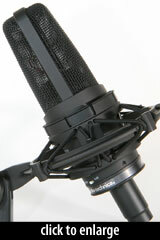 The other was provided by Audio-Technica on an evaluation loan. This pair will be returned to the manufacturer. Audio-Technica provided no compensation for this review. Thank you very much for including the kick mic and for taking the time to show some less common OH setups. That turns a one-sided mic review into something much more informative and applicable to the real world. Do more reviews like this, please! we’ve used AT4050s as our studio workhorses for years and years at Dallas Audio Post. They’re excellent VO mics, stand up well to the U87s in other studios, and they actually work very well as foley mics as well. They’re very quiet IMO, and just a little bright, but not in an unpleasing way. These mics are more familar to my ear than any other, and I love love love the versatility that they employ. highly recommended. I bought one way back when. The old spider shockmount’s suspension string disintegrated very quickly, but I replaced it with a thick shoestring. I still do not trust it completely, as I do not believe that it holds the mic securely enough. The mic actually fell out once, but survived. I hope that the new shockmount holds the mic better. Overall, the sound is nice, but bright, as the capsule is a bit smaller than most large diaphragm condensers. It has its uses, though, and works well on drums and some voices. I go to the Lawson L47MP, first, then a 414, SM7, or the Saturn, which sounds very intimate and looks GREAT! The 4050CM5 is next in line. A UAD 610 preamp helps warm it up. Damn, I passed up the chance to get this mic yesterday because I had never heard it before… I am now 600km away from the store. Some future date maybe, I do need a solid LDC. Workhorse indeed and the flagship of the 4000 series in my opinion. Great mic. I own an older 4050 that I bought used on eBay and had a newer (late 90s manufacture) 4050 from work. I tried both in figure-8 for spot miking in an orchestral situation and was shocked how much more accurate the older 4050 was in that pattern than the newer one. Maybe someone dropped the newer one or I overlooked something in my comparison, but the off axis rejection was superior for the older 4050. I wish I owned more than one. Thanks for a great, thorough review. I have a pair of AT4050’s and an AT4047, not to mention maybe 25 + others. If you need a PROFESSIONAL TOOL that works and does what it is supposed to do …this is it, baby. No hype, no BS, just really good sound. I’ve used the 4050s on bigband horn sections, as OH, on choral groups,at bluegrass festivals, on college string ensembles, and in coffeehouse recordings. They make great outriggers in omni when used with a pair of good SDC’s (like Beyer MC930’s). And don’t get me started on the AT4047…I ended up selling the U-87 because of that puppy!